Press Release: Stop the Gaza Siege, Finally! Hamas has committed themselves to a guarantee for safety and equal legal status for all citizens of Palestine – including Jews. 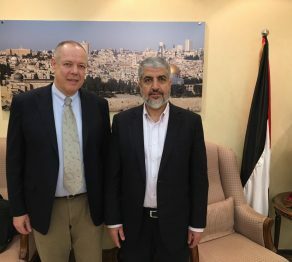 This is the most important result of a detailed conversation which was conducted on Tuesday in Doha between the chairman of the small German political party “New Centre” and the former chairman and now member of the Political Bureau of the Palestinian organization Hamas, Khaled Mashaal. Copyright © 2019 Neue Mitte - Ehrliche Politik: Wir dienen. Der Schöpfung.